ICT Computer training: ICT Computer Skills Training to TS High School Maths, Science Teachers in December 2017. Conducting ICT training to all the teachers of Maths and Science teaching in Secondary Schools. Regional Level ICT Orientation Programme. 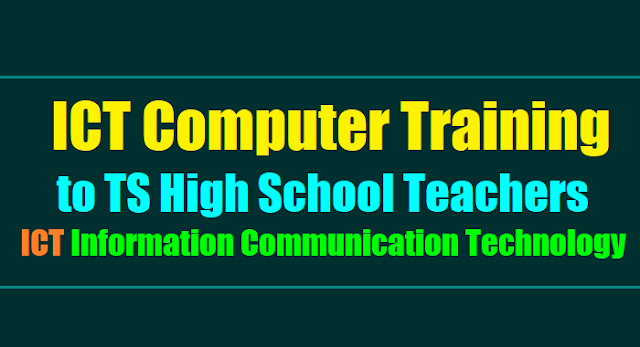 Information Communication Technology(ICT). PROCEED INGS OF THE COMMISSIONER & DIRECTOR OF SCHOOL EDUCATIOvN AND EX-OFFICIO PROJECT DIRECTOR, RMSA, TELANGANA, HYDERABAD. Rc.No.43/ICT /RMSA/2016, dt. 03.11.2017 :: Sub: Conducting ICT training to all the teachers of Maths and Science teaching in Secondary Schools - Developing District Resource Groups by way of conducting training at Regional level from 8th to 13th November 2017- Orders issued - Reg. Sub: RMSA, TS, Hyderabad - Conduct of 5-day orientation from 12.12.2017 to 16.12.2017 to the School Assistants Science on ICT in DIETs, CTE, IASE - Deputing the teachers to the training centres - Reg. The District Educational Officers in the State are hereby informed that vide reference cited, training to the District Resource persons pertaining to Maths and Science @6 per subject have been conducted from 13.11.2017 to 19.11.2017 at various DIETs, CTEs, IASE and SIET. Now it is proposed to conduct 5-training to the Science School Assistants working in High Schools from 12.12.2017 to 16.12.2017. The T.A. bills of SRPs & Observers will be paid at State Project Office, RMSA, Hyderabad. Therefore the District Educational Officers of Mahabubnagar, Ranga Reddy, Hyderabad, Vikarabad, Nalgonda, Warangal(R), Warangal(U), Karimnagar, Medak, Nizamabad, Khammam and Adilabad are directed to send Science Schools Assistants i.e.35 Science School Assistants from each district to the training centres as shown above. Further, the District Educational Officers of Khammam, Bhadradri, Nagar Kurnool, Wanaparthy, Gadwal Jogulamba, Medchel, Komaram Bheem, Rajanna Sircilla Districts who are failed to depute the Maths participants to the earlier workshop now directed to depute the DRPs to the training centre at SIET, Ramanathapur without fail. This is the last chance for the training of DRPs. The District Educational Officers are to identify committed teachers with expertise in computers and depute to the training as DRP. The expenditure for workshop at SIET will be as per earlier workshop conducted from 13.11.2017 to 19.11.2017. Therefore, all the District Educational Officers as indicated above are directed to depute the participants and resource persons to the ICT orientation in the Teacher Education Institutions. The District Educational Officers are directed to keep Sectoral - I / Nodal Officers in-charge for this programme to inform the participants and coordinate the programme. The District Educational Officers are also directed to keep MIS coordinator in the training centers i.e.DIETs, IASE, CTEs and SIET. The Principals of IASE of Hyderabad, CTE, Warangal and all the DIETs are directed to talk to the concerned to District Educational Officers for the attendance of the participants and MIS coordinators without fail and inform the strength of participants at lunch time on 17th December 2017 to the Consultant, RMSA, Hyderabad. The expenditure will be met from the funds already released from RMSA. C and DSE Telangana :: Proc.Rc.No.43/RMSA/ICT/2017, Dated: 25.11.2017 :: Sub : RMSA, Telangana, Hyderabad - Conduct of 5-day orientation from 28.11.2017 to 04.12.2017 to the School Assistants Maths on ICT in DIETs, CTE, IASE Deputing the teachers to the training centres - Reg. The District Educational Officers in the state are hereby informed that vide reference cited, training to the District Resource Persons pertaining to Maths and Science @6 per subject have been conducted from 13.11.2017 to 19.11.2017 at various DIETs, CTEs, IASE and SIET. Now it is proposed to Conduct 5-day training to the Maths School Assistants working in High schools from 28.11.2017 to 04.12.2017 excluding 2nd and 3rd December, 2017 being general holidays. Following are the training centres and name of the districts to depute teachers to the orientation. In case of training centre at SIET, Ramanthapur, Hyderabad the training will be for Science DRGs from the districts not attended training programme conducted earlier from 13.11.2017 to 19.11.2017. The T.A Bills of SRPs will be paid at State Project Office, RMSA, Hyderabad. Therefore the DEOs of Mahabub Nagar, Ranga Reddy, Hyderabad, Vikarabad, Nalgonda, Warangal - Rural, Warangal - Urban, Karimnagar, Medak, Nizamabad and Adilabad are directed to send Maths School Assistants i.e., 35 Maths School Assistants from each district to the training centres as shown above. Further, the DEOs of Khammam, Bhadradri, Warangal Rural, Warangal Urban, Mahabubad, Rajanna Sircilla, Jagitial, Karimnagar, Vikarabad, Ranga Reddy and Medchal districts who are failed to depute the participants to the earlier workshop now directed to depute the DRPs to the training centre at SIET, Ramanthapur without fail. This is the last chance for the training of DRPs. The DEOs are to identify committed teachers with expertise in computers and depute to the training as DRP. The expenditure for workshop at SIET will be as per earlier workshop conducted from 13.11.2017 to 19.11.2017. Therefore all the District Educational Officers as shown above are directed to depute the participants and Resource Persons to the ICT orientation in the Teacher Education Institutions. The DEOs are directed to keep one Sectoral I Nodal officers incharge for this programme to inform the participants and coordinate the programme. The DEOs also directed to keep one MIS Coordinator in the training centres i.e., DIETs, IASE, CTEs and SIET. The Principals of IASE Hyderabad, CTE Warangal and all the DIETs are directed to talk to the concerned to DEOs for the attendance of the participants. and MIS Coordinators without fail and inform the strength of participants at lunch time on 28th November, 2017 to the consultant, RMSA, Hyderabad. The expenditure will be met from the funds already released from RMSA. Director SIET, all the DEOs in the State, Principals of DIETs, CTEs and IASE are hereby informed that it is proposed to conduct training on ICT to the district level resource groups from 8th to 13th November 2017. Postponement of training programme to the two batches i.e., 13th to 15 and 16th to 19th Nov 2017 to 20th to 25th nov 2017/ Postponment of ICT training from 14th to 19th November 2017 at all DIETs, CTEs, IASEs and SIET. As part of CLIX work in Telangana, CLIX are currently in the process of training teachers from the 300 schools that CLIx is working with. Due to a date clash with the TROER program. CLIX are requesting that our training dates be shifted from 13-18 to 20-25. The detailed schedule is posted bellow. We request you to give your approval regarding the same. Hope you would do the needful. Following is the programme details. • It is proposed to conduct training in all the 8 DIETs, CTE, IASE, Private Engineering College, Mancherial and SIET. About 30 participants per center @5 per district. • The RPs identified are the teachers of Maths and Science who posses knowledge. of computers and digital practice. • The programme is for 6days i.e. 8th to 13th November 2017. • The State level RPs and two MIS Coordinators shall visit the centers ori 6th and make computer lab ready for the training. The MIS Coordinators stay on 7th and attend the lab readiness activities. ..
• The TA, DA will be paid for the participants, MIS Coordinators and as well as RPs. If DIET Principals provides accommodation along with boarding an amount of Rs.350/- is being provided towards lodging and boarding per persons per day. Incase there no accommodation lodge charges may be provided to the participants and RPs upto maximum of Rs.200/- per day based on the lodge receipts. • Rs.150/- Honorarium may be provided to resource persons and MIS coordinators. • The TA, DA, Honorarium etc. to the Core team members may be paid from State RMSA Office. The Principal I Head of the Institute shall act as Course Directors. • Mr. Gurumurthy, IT for change is requested to depute his team members to the 'centers to support the training. KY AN systems with in-built projectors can also be used, since Ubuntu Kalpavriksha'has been installed on them. • For each venue, ICT Lab, a lab charge of Rs 1,000 per day is provided as part of the . workshop budget, which can be used for regular lab maintenance, electricity, water, sanitation, menial charges etc. • The actual of internet connection shall be met from the workshop budget. • The Principals of DIETs, IASE, CTE are requested to take regular internet connection on monthly basis as per the specifications as above since it is used by the· students and trainees of future workshops. • A note book and pen may be given to the participants and also photocopy of students text book - Level J, II and III (English version) and teacher handbookISnglish version). Soft copy of the students text book, duly meeting the amount from the workshop expenditure. • Tea, Snacks and working lunch may be provided i.e. Rs.20/- per participants towards two times tea, snacks and Rs.SO/- towards working lunch is provided. • Rs.5.00 Lakh per DIET is now sanctioned and released as an advance to all the Principals of DIETs and Rs.5.00 lakhs each to IASE Masabtank, CTE Warangal, Mahabubnagar and SIET Ramanthapuar. In case of Mancherial amount 'of Rs.1.00 lakhs may be given to DEO, Mancherial to conduct training in private Engineering College, Rs.3.00 Lakhs Principal Model School Thimmapur. This advance will be for current and future workshops on ICT and other trainings from RMSA, Telangana. • The RPs are directed to provide soft copies of teacher hand books, students text books to all the participants so that they can upload the same in the school computers and implement the ICT curriculum. • The list of State level RPs, names of the centers and names of the participants each district, MIS coordinators, names of the core team members are enclosed. • The Principals, Director SIET may be requested to furnish the expenditure details for each workshop so that balance may be released from time to time.